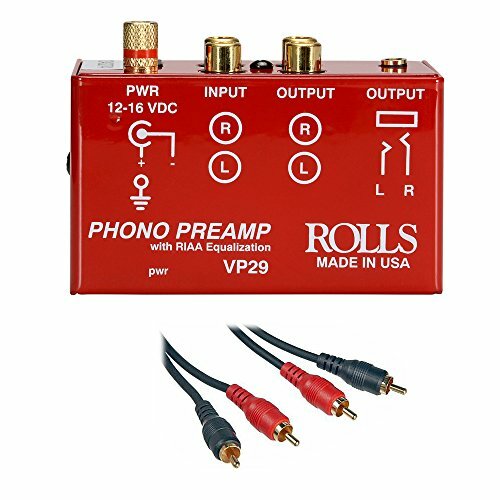 The Rolls VP29 is a phono/turntable preamplifier with provisions for line level output. The VP29 is designed for use with amplifiers, mixers or stereo systems that do not provide turntable inputs. The preamp features dual RCA phone inputs, ground terminal connection and dual RCA stereo line level outputs. A separate 1/8" stereo line level output is provided for added flexibility. Although the unit is DC powered (AC adapter included), its compact design make it both unobtrusive and portable. With Comprehensive 2 RCA Male to 2 RCA Male Cable is a general purpose dual audio cable that is perfect for those on a budget. General Purpose cables simply get the job done and are recommended for every day use and non-critical applications. Finished in Comprehensive's black matte jacket. Ideal for Left/Right audio applications.